The Guildhall was rebuilt in Georgian times (1769). 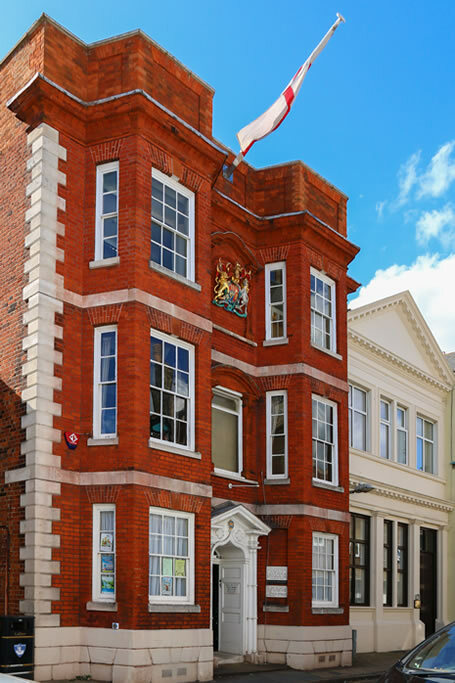 Set in the heart of the historic old seaport, Harwich’s Guildhall is a Grade I listed building. Originally the site of an inn named ‘The Bear’ it was purchased by the council in 1673. Its present design dates from 1769 and it remains the meeting place and administrative home for Harwich Town Council. The interior contains a fine panelled court room. In 1974, due to local Government reorganisation, The Guildhall became the home of Harwich Town Council, who restored it. Restoration revealed a medieval wall painting, boarded walls covered with engravings of 18th century ships and houses, carved into the woodwork, which had subsequently been plastered over. These engravings were probably created by prisoners, as this was part of the lock-up when the Police Station was contained within the Guildhall. The Chamber is a beautiful, oak panelled room, its walls adorned with large portraits and its windows including a stained glass depiction of the town crest. The chamber also houses the regalia show case containing the seventeenth century mace and the mayor’s chain of office. The parlour remains the personal domain of the mayor of the day and it houses gifts to the town and many other items of great local significance. Amongst its treasures are the town’s Imperial brass yard and a portrait of Charles II painted in the year 1675. A unique feature of the Guildhall is the Carvings Room, once used to hold prisoners waiting to be tried or sentenced. Etched into the bare, wooden walls of the room are elaborate carvings of ships, gallows and symbols to ward off evil spirits all of which date from the late 18th century. One carving is of a ship flying the Stars and Stripes dating from the time of the American War of Independence and another is of a hot air balloon dated at the time of the balloon dated at the time of the Montgolfier brothers.